A lot less smiling than last weekend. 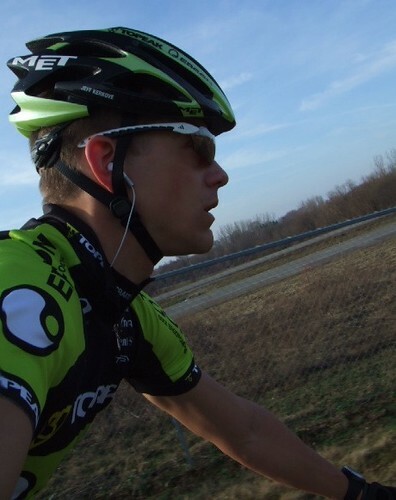 Thanks Van Dessel for the great Vest, gotta get some pics up of the whole kit. Couldn't believe I was able to get my jersey and shorts clean yesterday, but I scrubbed them until they are bright again. Ah the power of Oxy Clean. I am testing a seat bag for Planet Bike, it is big, but it works great, plus it stays closed in the rough stuff. The other cool thing is that it's big enough for 29er tubes, co2 and multi tools. You can get at everything by just un-zipping the end, so no need to undue the rail straps, its been great so far. Ran the Planet rear light and computer to see how they would hold up, both are still working post race and post car wash.
Ergon grips performed flawlessly in the mud, no loss of grip or slips what so ever. I really like the way they clamp on as well. No matter how much sweat or water you throw on them they will not twist on you. Planet Bike fender of course. I don't know why other people don't run these things when its going to rain, it helps keep the grit out of your face at high speeds. The Van Dessel Jersey Devil looking even better with a coat of mud.